Not all of you will be able to see these ads which is why I’ve included the screenshot. Basically WordPress.com are trial’ing ads from a company called “Luminate”. Luminate put their ads over the top over images. The ads can be closed by clicking the little cross at bottom right hand corner. 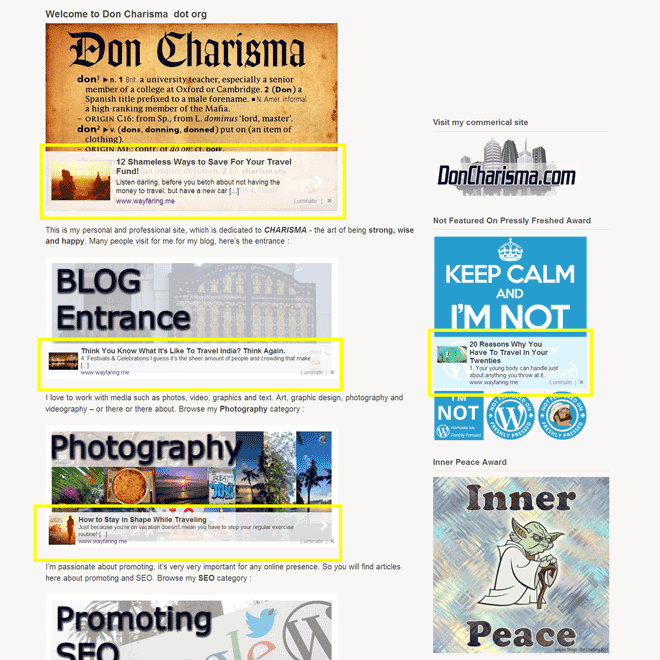 I am part of the WordPress.com WordAds program and I already have 3 advert spaces on my blog. The Luminate ads seem to appear randomly, and obscure part of my photos/images. They are additional to the 3 ad spaces already “rented”, so getting to be a lot of space taken up with adverts. Often I put text on the images, which gets covered or partially covered by the Luminate ads. So really the Luminate ads detract probably more than I’m prepared to put up with from my content. I don’t just yet want to depart the WordAds program all together, but I can ask for Luminate ads not to be served on my blog. However it may be that Lunminate ads are more lucrative than the others so could be missing a revenue source. I’m going to wait and see what my earnings are for April. If I don’t see a significant (and I mean really significant 🙂 ) change, I’m requesting they be removed. Becky, that’s almost exactly what I decided … they are a bloody nuisance, but it it’s really really worth it then I’ll keep ’em … do you know what the dates are that a) the impressions are calculated for, and b) when we’ll see the payment ? Thanks, and lastly how are you finding the WordAds in general ? Same really, it brings a small amount of money, yet to have anything viral, so you’re doing well Becky ! I just saw the ads on my blog today. They are awful and intrusive, especially on blogs where photos are a big feature. I was not contacted about these. I did not approve of them (I never would) and I don’t see how to remove them. Does anyone know how to turn them off? I have contacted WordAds now. No doubt they’ll be working round the clock with this one! Oh cool. Glad they reply quickly. There’s hope yet! How can I run Luminate Ads on my Blog? I already have these WordAds on my Blog, I thought Luminate ads is some different thing. Seems like they’re posting their billboards on your highway and offering you a pittance of rent after the fact (oh, were we stepping on your lawn?) when your real estate is worth more. Are you losing or antagonizing followers because of them? I ignore most ads, but if you’re making a few pennies, it has to be your call. What about incorporating a “donate” button instead for some income….say if people are using your images they might like to contribute a little (seeing as we still have to rely on a monetary system). When people suggest a setting to photograph they might also like to contribute a little???? How about it everyone? I prefer blogs to be ad free. Don’t like the way it covers your images. For sure, totally agree ! Don, I would agree with yer other readers re:placement of ad’s. However, I can’t remember a time where I have been seriously inconvenienced by an ad here on WP. Earning money doing what we love is probably what many of us dream about doing. I don’t believe it cheapens or makes the blog post suspect of “sell-outery” in most instances, but it an in many cases produce resources for more and dare I say it better creativity. Maybe the ads are seen only if you do not have a Premiun account? I dont find myself often clicking on adverts. Do you see clicks going to them in your stats? I agree with edmooneyphotography. If you were able to place them in the sidebar then better. But, I wouldnt want them to make mine or your blog to busy. Well I have a premium account and I see ads … the equation I think is slightly more complicated … it depends on what jurasdiction one is in, it depends on what data the ad people have on the viewer (if he’s been searching for hard drive on amazon, then he’ll likely see ads about hard drives), it depends on what the content on the page is and what type of website the ad agency thinks it is – I often get travel related ads because I blog a lot about thailand … it depends on what device and browser they are using, the wordpress ipad app doesn’t seem to show any ads for some reason … and so on ! Very useful to get your comments, so please do feel free to comment ! I can see this for people who use the totally “free” venue, but those of us who pay for custom themes or .com should not have to have these. Actually, I don’t care for people who sell their stuff in the blog venue, just because it may be free. So no adverts!!!!! of any kind. OK, that’s good and in a world of ideals I’m with you on that … at the moment, having my monthly eating out in a restuarant being paid for by the advertisers, I’m grateful for … once I’ve figured out alchemy, I’ll get the ads removed ! This morning. It seems all of a sudden, the ads were gone. If your making money and that’s what you want to do, I say go for it. 🙂 I think the ipad add doesn’t show any ads at all, so you’ve found an ad free way to view wordpress ! I haven’t seen these ads, so i am not bothered by them yet. ^_^ I think it is great that you are receiving money from them thou. Every little bit does help. I just looked at your .com site and it is really nice Don. Congratulations I hope it brings you some great business opportunities. Hi Don I see 4 adv luminate on your blog, on the right side bar. too many adv make people dong like to visit our blog 😦 . I’ve seen them but i think it makes things look busy but that’s just my opinion. I’ve not really had to close them though so that I’m confused about. They never seem to interfere with me commenting and Lord knows I comment a lot haha. LOL, totally Laura, it’s a tradeoff between profit and aesthetic/operability … the wordads thus far had been relatively tasteful, but these luminate ads are different, in that they are covering images, and I do quite a lot of work with images ! Yeah that’s no good if they cover up what you are doing with your blog in the first place! But wow in that you even have income from your blog! I’m just happy to have a few followers, lol. LOL, well as explained Laura, income as in a little money coming in, but it’s only around 1/4 of my electricity bill so it’s not an income income … I live in hope ! I gave up wordads completely as I can’t control the quality of ads being served. You should always know what goes in your stomach, in this case, what ads are being displayed to your viewers. Quality vs small revenue, it narrows down to that. This is just an opinion. Many people like wordads, but that’s just a compromise you got to make with your blog. Thanks Ed, and of course I realise your opinion, have no problem with that … I find putting out to find others opinions useful and sometimes others are asking the same question … and I totally get your point of view ! I have the Luminate ads program on my blog, too, Don, and some readers have said they don’t like it in my comment section. I told them about clicking the little black cross to get them to vanish, like you did. It’s annoying, but I’ve decided to let it go for now because, like you said, every tiny bit adds up. We shall see how long my patience lasts. Thanks for putting the topic out here! I would be very unhappy if my content was covered by the Ad. No one invest time, energy and resources to have their work improperly displayed. So I figure there has to be a happy medium…..such as having the Ad’s placed on the side. Just my thoughts on it. Too many ads can get really irritating, it would turn me off. I feel like I’m getting chased by ads wherever I look but perhaps I’m not a good example as I’m a passionate hater of inserted ads! Whilst I personally like the idea of a source of income, I think that it would not be worth the hassle cause by obscuring ones images. Maybe I am bias as a photographer, but this would bug the hell out of me. I think it would be far better if the ads were placed in either the side bar or above or below a post like in Google. Thanks Eddie, I think I’ll probably tell them to stop doing these on my blog … but good to ask around, sometimes people have angles I didn’t think of … and yes for image dependant blogs like photography, these don’t work too well really !